Most of the time spent by your kid in school would be on activities like reading and writing. These can cause a lot of visual stress that can adversely affect their eyes that are still growing and developing. Research indicates the relationship between excessive close work and short sightedness or myopia. This is true when they have improper work habits related to near tasks. • Eye examination at an early age can prevent vision loss to ‘lazy eyes' or closed eye through proper treatment. Re-examination at the age of 3 and again at 6 is recommended. Later, an examination once in 2 years is recommended. • Only an ophthalmologist prescribed spectacle should be worn. • Place a book mark after 3 or 4 pages for your child to take a break from reading. Never allow him to read continuously. • Most near tasks are very tiring for your child. Ensure that after every 20-30 minutes, your child rests his eyes when he is doing any near task. • The illumination for your child's study table should be 3 times brighter than the surrounding illumination and should come from the side or over the shoulder. Avoid having the light source directly over-head and in front as it would reflect from the reading material and cause a significant glare. • While writing, if your child is right handed then place the light source on the opposite side to avoid shadows caused by the hand. 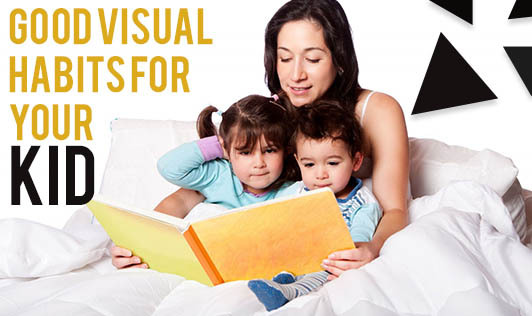 • Make sure the distance between the reading material and your child's face is 35-40cm apart. Also, ensure your child sits upright while reading. • While using the computer or playing a video game, it is essential to maintain a distance of at least 26 inches from the monitor. It is ideal to take frequent visual breaks so he gets to rest his eyes. • A distance of at least 5 feet from the television is recommended for your child.